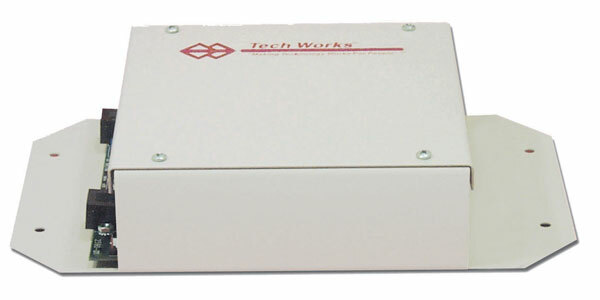 The Tech Works 2590 is a Telephone Interface Module designed to allow any Standard Caller I.D. Telephone or PBX trunk port to become a display Master Control Station. The 2590 provides all analog station support including Ring Voltage, Talk Battery, Dial Tone, Busy Tone, Reorder Tone, DTMF Decode, and Caller I.D. for Visual Display and communication with any Tech Works RS485 network. By simply connecting a 2590 to any existing (Rev 2 or later) Tech Works network you can send and receive calls from a Cordless Phone or a PBX Desk Station. A standard RS232 serial interface to the installers PC allows programming of user dial codes and display messages for each of 512 network addresses. When the phone rings the programmed message is displayed and the user has the option of taking or queuing the call. Queued calls will ring back if not cleared in a programmed amount of time. When the user takes the call an open voice communication is established with the calling station (the network includes Tech Works Voice-Call Substations). To call a station the operator simply dials the programmed number for the desired Substation. If more than one call is in the queue the operator can scroll through the pending calls with emergency calls always appearing at the top (full use of system queuing is determined by the telephone station hardware used). Through the use of the latest in solid-state digital technology the operator is in complete control. Integral voice operated control (VOX) senses when the operator is talking and automatically adjusts the system for optimum transmit performance. When the operator stops talking the Substation automatically allows the operator to hear every sound from the distant location.